Linda Roherty, PT, CLT-LANA from Provena St. Joseph Hospital in Elgin, IL made an informative presentation at our Mastectomy Support Group on July 13, 2011. What we all learned was amazing and startling. I took pages of notes and soaked up the information so I could share it with you. This section may get pretty technical, but I’m hoping it will arm you with the knowledge you need to help close the knowledge deficit about lymphedema. 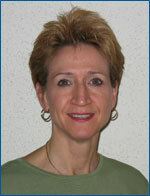 Linda is a physical therapist and certified lymphedema therapist who is also the secretary of the Lymphedema Association of North America – just want to let you know that she is very much an expert. First, a definition of lymphedema. It is the swelling of areas of the body (arm, breast-anterior trunk, posterior trunk) as a result of trauma to the breast area. For our purposes, the ‘trauma’ we’ll address is ‘secondary,’ due to a mastectomy, lumpectomy, lymph note dissection or removal, radiation treatments or by tumor blockage). There is also ‘primary’ lymphedema, which happens as a result of a birth defect of fewer lymph vessels. Lymphedema is most likely to occur around nine months after aforementioned ‘trauma.’ Anyone who has undergone trauma is at risk. In my case, I had four lymph nodes removed so statistically have a 4-11% chance of developing lymphedema in my lifetime. The more lymph nodes you have removed or more ‘trauma,’ the higher the likelihood of developing lymphedema. Can lymphedema be prevented? Unfortunately, no. But the good news is that you can do many things to reduce your personal risk. I hope the following information can help educate you and your loved ones about helping to reduce your risk. These are the most common: 1) arm feels heavy; 2) full feeling; 3)numbness; 4) fatigued sensation; 5) swelling. A qualified medical professional diagnosis lymphedema via the following: 1)patient history; 2) physical exam; 3) subjective information; 4) medical tests to rule out other conditions. STAGE I: Swelling starts gradually – perhaps your ring on finger feels tight or clothing fits tighter. Elevation and rest reduce symptoms. STAGE II: When affected area of the body is pressed, a pitting edema occurs, or an indention that takes time to go away. 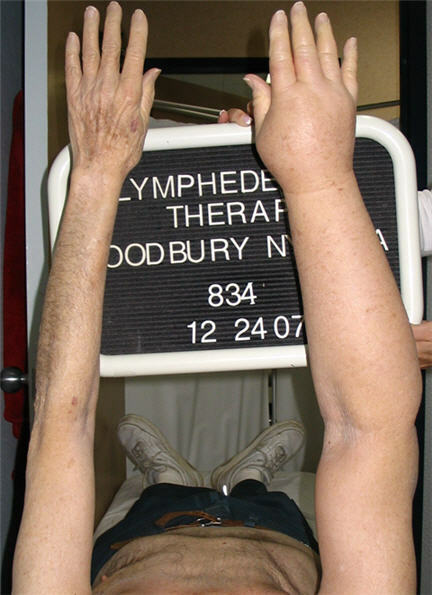 Most lymphedema’s are identified in this stage. STAGE III: Affected area/s of the body are grossly swollen and causes additional complications like infection. The earlier you seek treatment, the better results you will have to maintain lower stages and/or relieve symptoms. 1) axillary dissection (armpit area); 2) radiation therapy; 3) obesity; 4) infections; 5) seromas; 6) knowledge deficit. The last one, #6 knowledge deficit, caught me off guard during the presentation. But once I learned more, I realized not knowing how to minimize my chances of developing lymphedema was critically important as of this writing I’m in statistically the height of incidence. So what does this really mean? It is all about self education and self management and learning how maintain a balanced lifestyle. Your days of helping move the piano are over. A good excuse if you ask me. Starting new heavy exercise that involves your affected area is also not a good idea. You should check with your medical care provider to assess your new limitations and make prudent daily decisions. Do you travel often? Can you take pack two twenty pound bags instead of one forty pound bag? Can you check the heavy luggage and only carry on a small bag to avoid excessive lugging through the airport? Can you tip a porter or use a luggage cart instead of trying to carry everything yourself? It is these types of personal decisions, along with the degree of ‘trauma’ that determine your risk of developing lymphedema in your lifetime. More information on reducing your risk while traveling may be found at www.lymphnet.org. 1) Skin care – avoid trauma/injury to reduce infection risk: keep extremity clean and dry, apply moisturizer daily to avoid chapping/chafing of skin; attend to nail care and DO NOT cut cuticles; protect exposed skin with sunscreen and bug repellent; use care with razors to avoid nicks and cuts; wear gloves, especially while performing activities like gardening or using tools or chemicals; if scratches or punctures occur, wash with soap and water, apply antibiotics and watch for infection (redness); if a rash, itching, redness, pain, increased skin temperature, fever or flu-like symptoms occur, contact your physician immediately for early treatment of possible infection. 2) Activity/lifestyle – gradually build up intensity and duration of an activity; take frequent rests to allow for limb recovery; monitor the extremity during and after activity for any changes in size, shape, heaviness etc. ; maintain your optimal weight. 3) Avoid limb constriction – wear loose fitting jewelry and clothing; avoid having blood pressure or any punctures (shots included) on the at-risk extremity. 4) Compression garments – if your medical professional has recommended you wear compression garments, they should be well-fitting, should support the at-risk limb during strenuous activity and worn during air travel. 5) Extremes of temperature – avoid exposure to extreme cold, which an be associated with rebound swelling or chapping of skin; avoid prolonged exposure (15 or more minutes) exposure to heat, particularly hot tubs and saunas; avoid placing limb in water temperature above 102 degrees Fahrenheit (38.9 degrees Celsius). 6) Additional practices specific to lower extremity lymphedema – avoid prolonged standing, sitting or crossing legs; wear proper, well-fitting footwear and hosiery; support the at-risk limb with a compression garnet for strenuous activity, except in patients with open wounds or with poor circulation in the at-risk limb. NOTE: The majority of these recommendations are based on the knowledge of pathophysiology and decades of clinical experience by experts in the field, but there is little evidence-based literature regarding many of these practices to support them.